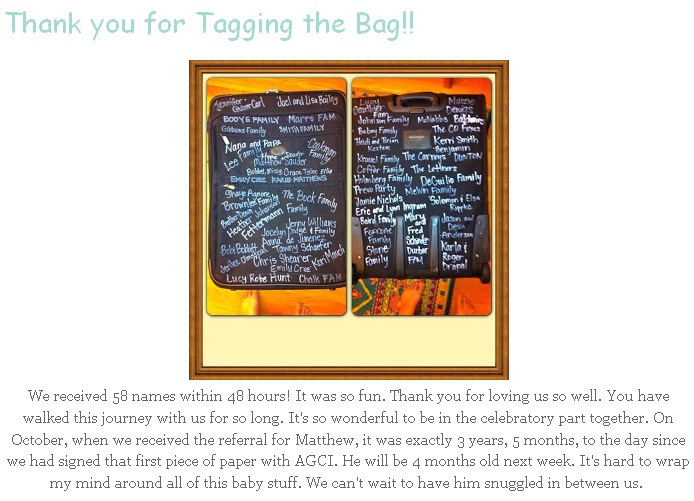 A while back I came across a brilliantly creative fundraising idea: The Tag The Bag Fundraiser. The Ripkke's raised $3,500 first time around. They then raised a considerable portion of their $17,000 goal for their second adoption. The Besk's raised $3,250 in 48 hours for their adoption of Matthew. Although this idea was used to raise funds for adoptions, it can actually be used for any type of fundraising drive for a specific person, or that involves travel. 2. Then ask for donations and tag the donors names onto the bag. The best way to take donations is through a FREE Online Fundraising Page. 3. Finally the bag is given to the person who the fundraiser is for, and used for their travel purposes. Fundraising is most effective when you can link the donor to the cause. When you can make the donor feel part of the cause and it's story. And that is exactly what the Tag The Bag Fundraiser does. 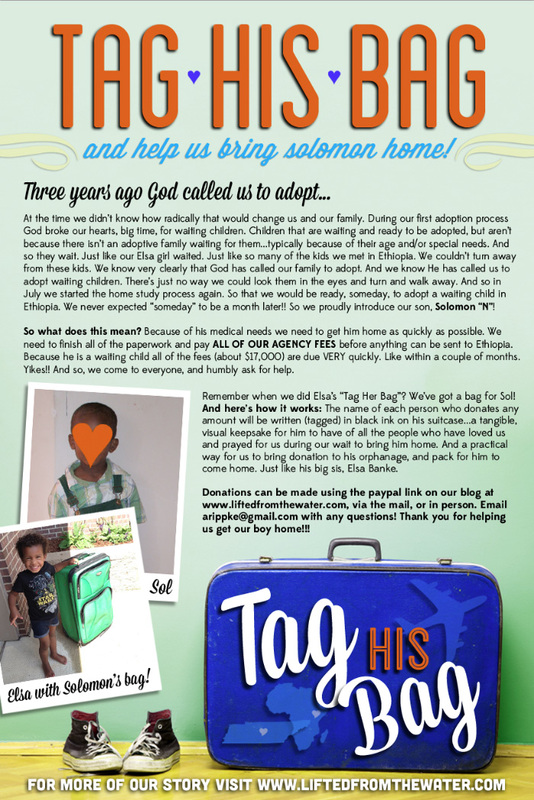 By allowing donors to tag their names on the bag, they are now a part of the adoption (cause's) story. What Other Fundraising Causes Would This Work Well With? ANY fundraiser that involves some form of traveling or transition in life. Before using this fundraiser, make sure that it is a good fit for your fundraising need. If the bag won't be an integral part of the cause or journey, then it's not the right fundraiser. Then... Plan carefully! Don't just rush in. Ask yourself - what your goal is, when you need the funds by, who will most likely give donations, and how will you promote the fundraiser? Have a Fundraising Team - The more people who actively promote your fundraiser, the more funds you will raise. Simple mathematics. Know your Lists - Each of your team members have lists, which you can broadcast your fundraising message to: Email contacts, Facebook friends, Twitter followers, etc. Have a meeting, and go through each members list, writing down exactly how many people they have on each list. Then decide how you will promote your fundraiser to each list. Create a Fundraising Message. Don't just ask people to donate and have a donation button for them to click on. You need to tell the story of your fundraiser, and how it is important to you, the world, and most importantly, the donor. You need to show them how their donation is going to make a difference, AND HOW THEY WILL BE RECOGNIZED FOR IT. So... have a full written message/appeal on your fundraising page. I would highly recommend you have a video about your fundraiser as well. Stats show that campaigns with videos raise more. And then adapt that message/appeal for each of the lists you will broadcast to. Obviously those messages all need to link back to your fundraising page with a "call-to-action". Launch and Promote. Create momentum into your fundraiser by promoting to all your lists at once, with a "Launch"! Then continue promoting to, updating, and thanking those lists throughout your fundraiser! Also make sure it's easy for others to promote your fundraiser. There should be Social Sharing buttons on your fundraising page, that you encourage people to use. Individually thank each Donor on Social Media, with a photo of their name on the bag. Obviously it is incredible important to thank the people that support your fundraiser. But this will also help promote your fundraiser further!!! Lastly - Combine it! A great fundraising idea that will compliment your Tag the Bag Fundraiser is an online T Shirt Fundraiser. Check it out. Check out the Ripkke's tag the bag fundraiser story here. And take a look at Julie Gumm's article on this fundraiser. Of course a bag isn't the only thing that you can have a Tag-It Fundraiser with.